I’ve been distracted by an apricot. 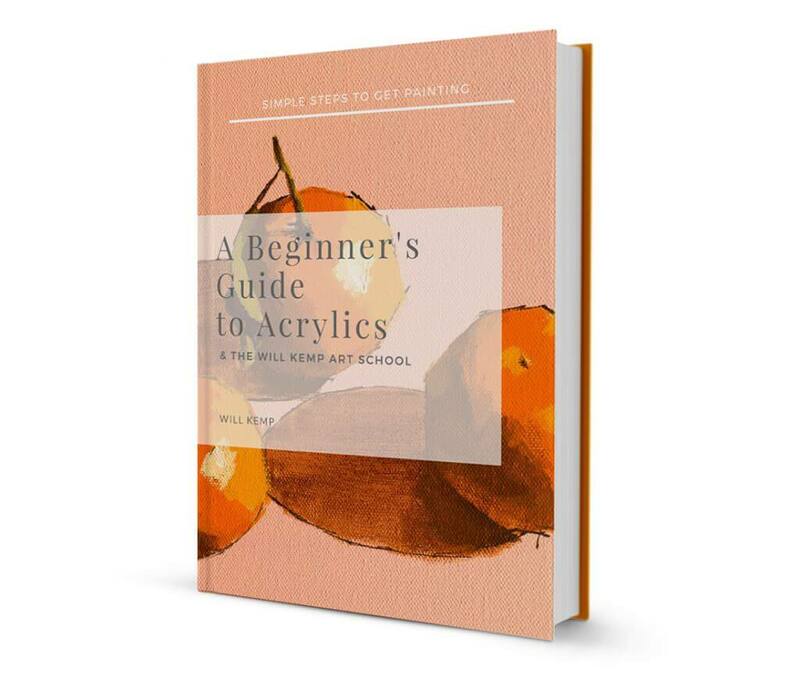 It’s not the usual thing that grabs your eye but I’m deep in the midst of filming a new simple colour mixing course and the apricots have got me. 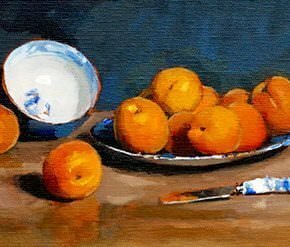 They were the perfect subject to teach colour theory for one of the studies and as I arranged them in the studio, a light, impressionistic, muted blue and orange composition began to form. Pleased with the setup, I headed down the garden for a tea break. 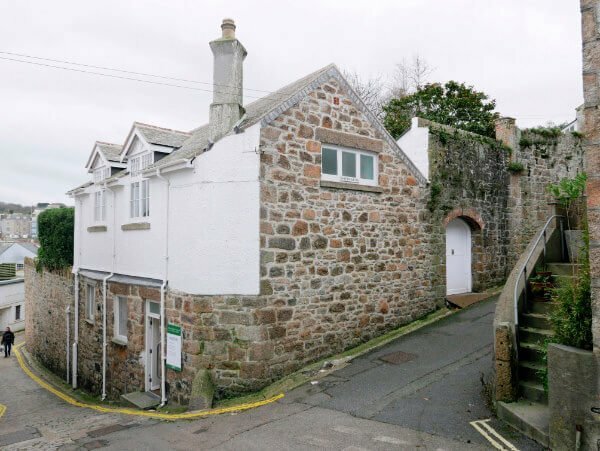 On a brisk winter’s morning in the coastal town of St Ives, we negotiated our way down the steep lanes, past whitewashed slate-roofed cottages to Trewyn Studio. 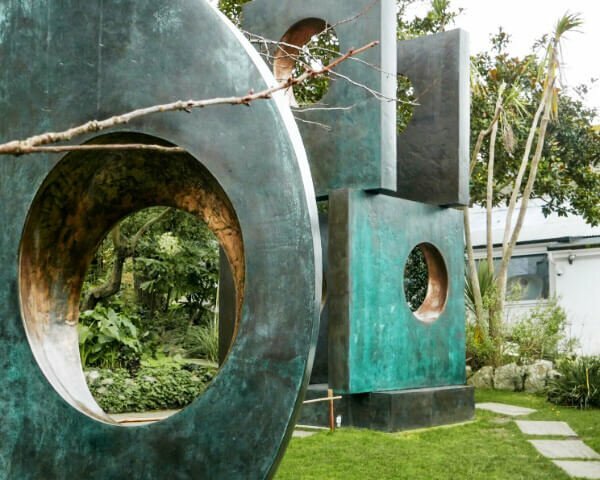 Home to one of Britain’s most important twentieth-century artists, Dame Jocelyn Barbara Hepworth (1903 – 1975), who lived and worked here for more than 25 years. Her secluded garden studio lies behind the white arched doorway and protective stone walls to the right of the house. 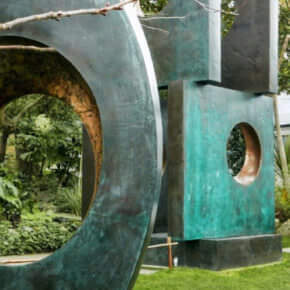 The property is now owned by Tate gallery but has been left as close as possible to when she worked in the gardens under the Cornish light and amongst the seagulls. Last week I was lucky enough to spend a few days in South Cornwall and caught the most fantastic weather. I’d visited this stretch of coastline before and enjoyed fabulous Summer sunrises & sunsets, fresh seafood and sparkling Mediterranean colours. Seasons can often show you new sides of a landscape and experiencing it all again in Winter was totally invigorating. Atmospheric mist enveloped harbours, it was wilder with more dramatic changes in light, and the sombre Winter palette reminded of James Abbott McNeill Whistler’s landscape paintings. Morning class! This week we’re in a Victorian townhouse. 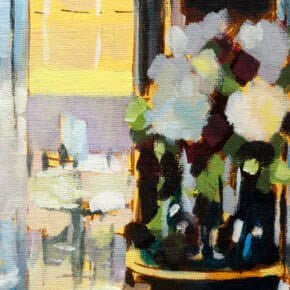 I’d been visiting for afternoon tea when the play of light in the hallway caught my eye. The warm sunlight coming in from garden doors to the right cast a real glow onto the yellow wooden wall. The floral arrangement reminded me of the peonies in the Floral Still Life Painting Course, and you can start to see how compositions can be built out from one point of reference. There was a natural blue light coming from a window in the hallway out of shot to the left, and an orange incandescent wall lamp, higher up on the right, both contributing to the warm and cool tones in the flowerheads. 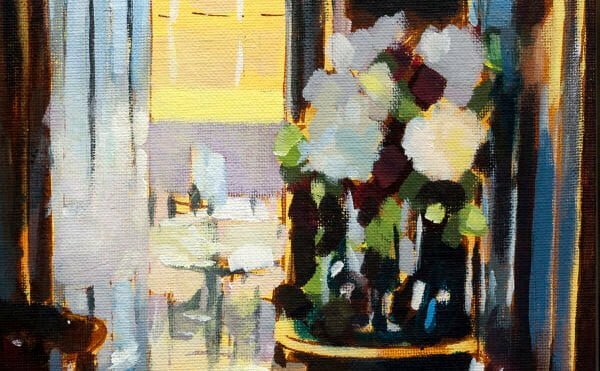 This step-by-step acrylic tutorial looks at balancing different areas of light and shadow (chiaroscuro) when working on a sunlit room interior scene. 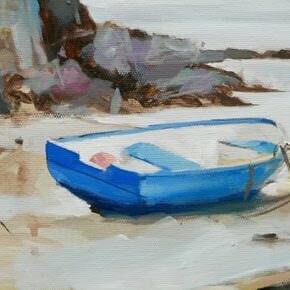 If you have trouble creating a realistic form within your still life’s, then you would see instant improvements through the lessons. Why? 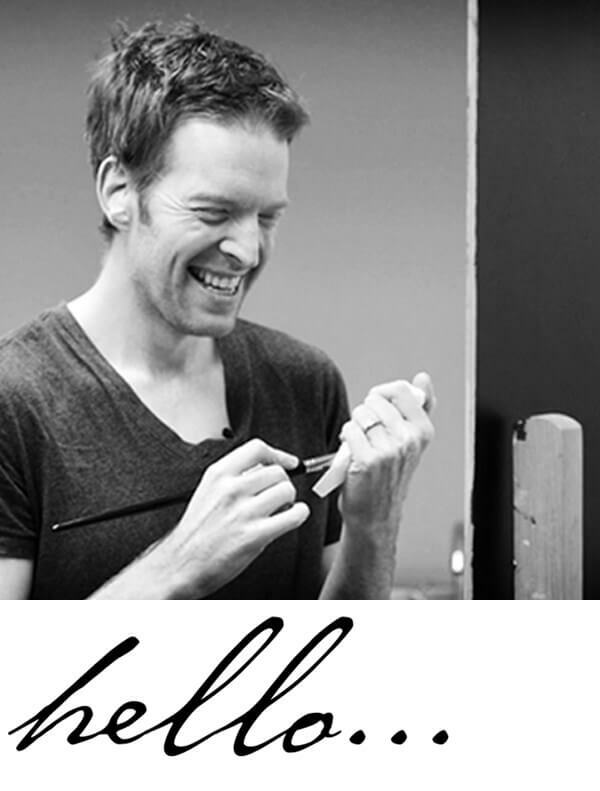 Because when you will understand how changes in light influence change in value, it can transform your paintings. 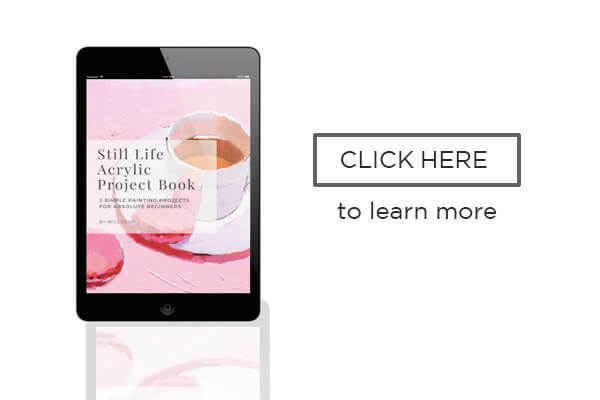 Throughout the e-book, I’ll guide you through 3 full-colour acrylic paintings from start to finish. 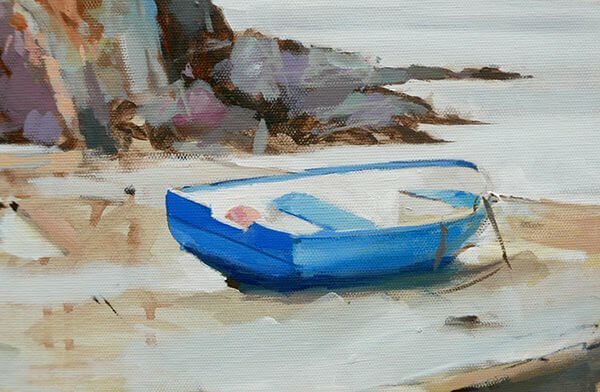 I’ve broken each lesson into bite-size pieces, so you can complete each stage of the painting within a 2-hour window, something you can easily follow, even if you’ve never painted before. 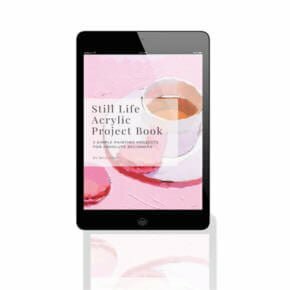 This week I’ve been working on the last stages of my new beginner’s acrylic project book and wanted to add some pen and ink illustrations of materials & still life setups. For all the sketches I used the following pens on 220gsm cartridge paper. 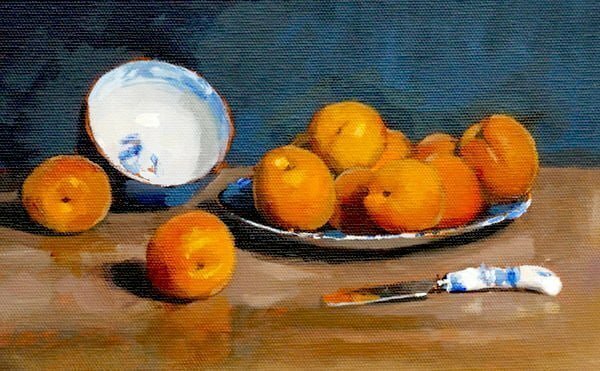 A number of the illustrations below are based on famous still life paintings. I always think looking at the pieces in black and white is interesting as you see how much the composition reveals an artists style. 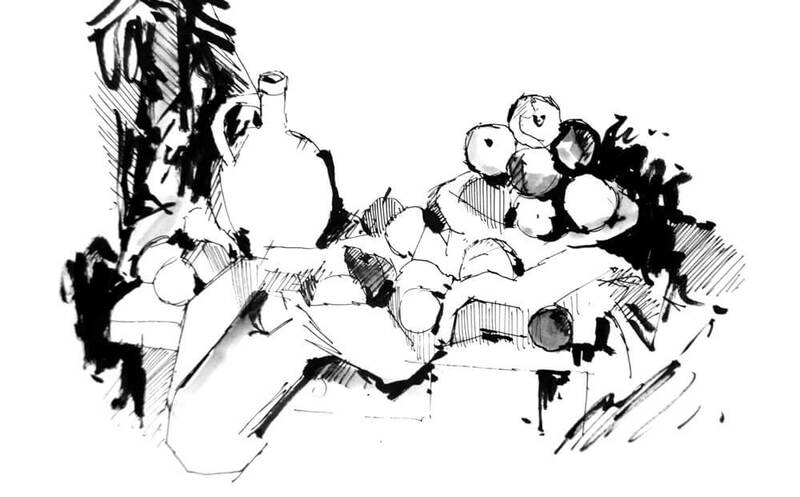 If you compare the shapes in Cézanne’s work to Morandi’s, there is a different set of compositional interests.